Glenn Starkey certainly knows how to weave a tale. 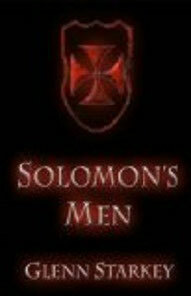 All I needed as proof was to sit down with Solomon's Men - and lose myself completely. Does the name Greg Valdez of Solomon's Men mean anything to you? Before two days ago, I had never heard Greg's name yet now I think of him multiple times throughout the day. Greg has endured his share of pain throughout his relatively young life. Dropped off at an orphanage (when only a few months old) he journeyed through life as children and young men do, without the benefit of parents to love and nurture him, to offer sage advice and words of wisdom. Years later, he fell in love and his wife brought to him a son (Daniel) - but things were far from ideal. Daniel was born with autism and his mother continually blamed herself; her depression ultimately led to suicide. Greg had more grief than he could handle and the price tag on his son's professional treatment was hefty. Six years after admitting his son to the facility, he thought one more job would enable him to retire. Having been a professional thief for numerous years, he accepted a job to go to a monastery in Portugal and retrieve, then return, an artifact which was deemed as stolen property. He had no idea that he had been summoned to retrieve the true Burial Shroud of Jesus. A monk interrupted his mission which set events in motion Greg Valdez couldn't have foreseen. From Portugal to Canada, to New York, Texas and Colorado, Greg Valdez was on the run. A group of Monks, a part of Solomen's Men, were commissioned to find the Shroud but the collector who had paid so highly for it coveted having it in his possession and would stop at nothing to get the Shroud in his hands. Solomon's Men took me on various journeys within its pages. I saw love blossom despite circumstances. I witnessed the laying down of one's life on multiple occasions. I saw a shepherd who fought to protect his lamb, even at the price of nearly dying. I saw, firsthand, how deeply the human soul could relate to compassion, sorrow and never-ending guilt. I, Norma Budden, was privileged to witness many miracles unfolding in various lives. I saw justice metered out, swift and sure, as men were slain for the sins they committed against others. A few men found redemption, though not likely in ways one might expect. All in all, by the time I finished reading Solomon's Men, my thoughts had turned to the Holy Bible. I reminisced about a Shepherd, Jesus Christ, who laid down His life for His sheep, so they might find blessings such as peace of mind, joy, love, forgiveness, understanding and healing, to name a few. In fact, if I had to choose an alternate title for Solomon's Men, it would have to be, No Greater Love, because, in essence, it's what the story was about from the first word to the last. Have you read this book? I'd love for you to share your thoughts at Amazon or Goodreads. If you haven't, I'd strongly encourage you to give this author a few hours, even days, of your time. Within the pages of Solomon's Men, your soul just might find healing. If you would like to learn more about Solomon's Men, please click the book cover which will take you to its page on Amazon.